In April I went to an online party in one of our Alliance Guild Halls. There was virtual dancing. We don’t have Alliance parties very often, but when we do, we enjoy them. 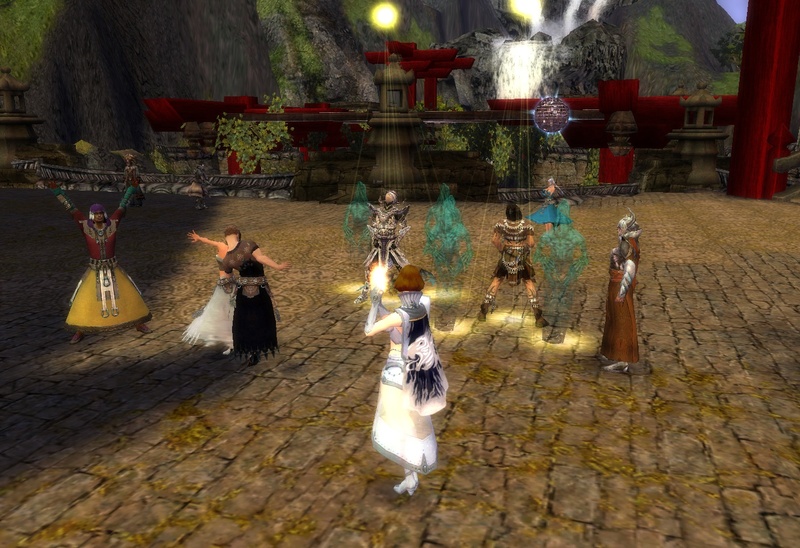 At the end of April, Guild Wars had an in game festival to celebrate their four year anniversary. I came from another multiplayer game world, Uru, where there was very little to do. Consequently, I was amazed that a game company would give you fun stuff to do, in game, for something that only lasted one week. We had events in Uru, but we had to “make do” with what we had. One could say that this showed creativity on the part of the Uru players, but it just didn’t seem right. It’s hard to play “let’s pretend” with no props and nothing changing in the game. I’ve learned that many multiplayer games have festivals. People like to come together, in a virtual space, for a reason, for something special. The festivals in Lord of the Rings Online are said to be quite good, particularly in the hobbit areas. This makes sense – you can imagine the Shire having really good festivals! I enjoyed the Anniversary Celebration. I’m playing a game of chance where you stand on a ring, and some sort of blast knocks you down. If you don’t fall down (not up to you) you win. 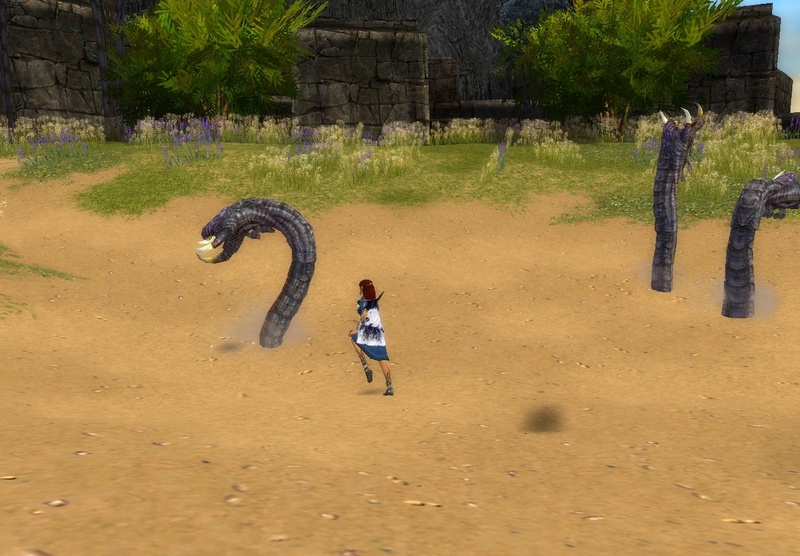 A “whack the serpent” game, where the goal is to tag the serpent heads that rise up out of the ground. I’m a slow tagger, so I only won when I was the only one playing! 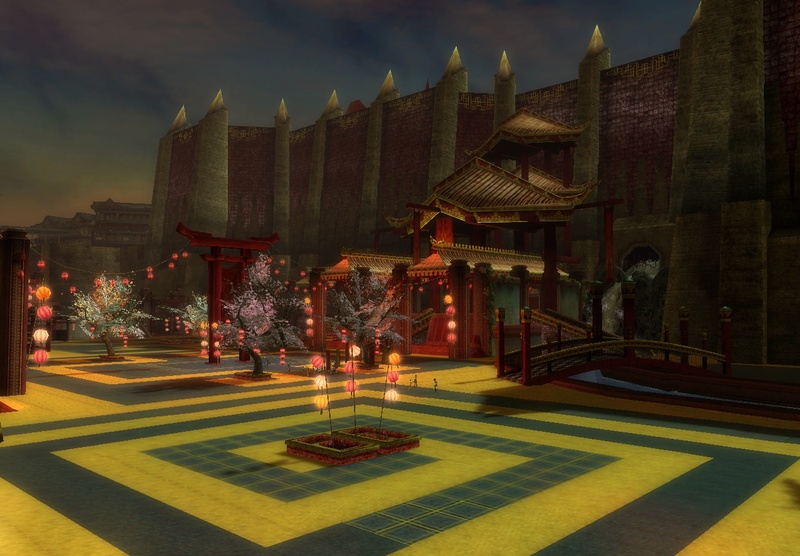 Here is a view of the Dragon Arena, so lovely and festive. I didn’t play, I just visited the place. In Guild Wars I’m still working up to playing with “real” people. I want to combine it with my solo play. I’m waiting because I’m still figuring out all the basics, such as everything the little mini compass map shows you. An example is the red dots on the compass map – the red dots are the baddies. When I couldn’t find the cave I was looking for, I amused myself by watching a red dot suddenly appear on the compass map, as an evil mutant monster insect/crustacean thing rose up out of the ground in front of me. I feel bad killing the variations of gargoyles in Old Ascalon. The gargoyles seem to have some sort of a culture (albeit a grunting one), but those monster insect things deserve to die. It takes me forever to orient myself in a new part of the world. My sense of direction is not great in “real life”, and it’s not great in the game. I accepted a quest that sent me to Shalev’s cave (Old Ascalon area) – how hard could that be to find? I had it marked on a map I printed out. 3 hours later, I never found it, but me and my tough little priest henchwoman killed a bunch of monsters. She’s my computer generated companion, but I’m getting quite fond of her. The next day I discovered I was looking in the wrong place for Shalev. I also learned what I didn’t know about the compass, the mission map and the general map! I’m a member of a “Guild”. More specifically, my characters in-game are in a guild. My guild is in what is called an “Alliance” of 10 guilds. The in-game purpose of guilds and alliances is for PvP – player versus player combat. Combat can be between individuals or groups. Guild Wars has several ways of doing this, all of which are said to be interesting and fun. But – you don’t have to do it. Some of our alliance guilds are into PvP, some are not, but it’s all OK. We also use our guilds and alliance for friendly socialization, and for helping each other out in the PvE part (player versus environment) – where we defeat the evil beings in our world. I was invited to join an established guild and alliance. Each guild had made enough progress to get their members guild halls. Guild halls consist of an interior and surrounding space, often an island. These are shared spaces where only members of our guild and alliance can visit, unless we give someone an invitation. The spaces are beautiful. I love visiting them – so peaceful. You can talk to people in Guild Wars via text chat to the people in your play area, your Guild, your Alliance. I started to chat with people in the Alliance chat – nice friendly people. It makes the world seem more like an actual world. Even if you are doing something by yourself, there are other people in the world, some of whom you know. It’s nice. My elementalist/priest (magician/healer), right, and my henchwoman priest (healer), left, battle a really ugly monster. Last Friday night and Saturday day I played Guild Wars, for the first time in months. Guild Wars is an MMORPG, a multiplayer role playing game. Guild Wars makes extensive use of “instancing”, where you have your own copy of an area, all yours to play in. The towns are full of “real” people, but the quest areas consist only of you, whoever you choose to bring with you, and the typical computer generated characters that make up games. I like that a lot. I can play with people or not, as I choose, and no one gets in my way or spoils the fun for me. I can also take things slowly when I play by myself – no pressure if I’m slow or take a long time to learn something. I like interacting with people in an online world, but I’m not good at both socializing and playing a game with people. I’d rather run around and talk to people in the world, and then do the quests by myself. This works for me. It also works well for the story. I’m not much of a role player – I don’t like to be completely “in character” in an online world – talk completely as if the world was real. 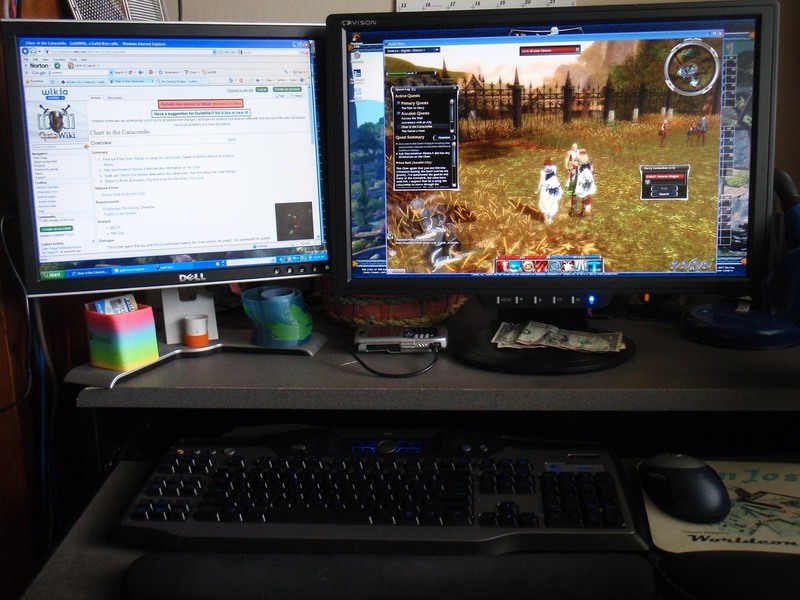 Most people have my playing style – strict roleplayers are not common in online games. However, when I’m in a quest area, all by myself, that’s when getting involved in the story and really feeling like you are “there” – that’s when it takes over. When I’m by myself I can get more into the world than when I’m socializing with people. Being with people is good too – it’s just different. I haven’t played Guild Wars much since school started at the end of August – no time – so my February 27th and February 28th play time was a treat. I fell in love with Guild Wars again. It’s hard to explain if you’ve never gotten into an online world. Yes, this is a fantasy setting (like Lord of the Rings, but different) but it works for me. It’s a wonderful escape from the real world. My primary character is a magician/healer – in Guild Wars terms that an elementalist/monk. Combat is beautiful – calling on the elements (earth, fire, water, air) is great fun, and there are wonderful special effects. There’s also a story. I’ve finally gotten past the good times – before terrible things happened to my part of the world. I’m at the point where evil monsters almost destroyed our main city, and us. The world is different now – a different kind of beauty, more stark, ruined, we are barely holding on. The world has also opened up to me. I’ll be able to travel to other areas that aren’t destroyed and see new things. I’m looking forward to seeing the Jade Sea. From one of the Guild Wars wikis – “The Jade Sea is located on the eastern side of the Canthan continent. 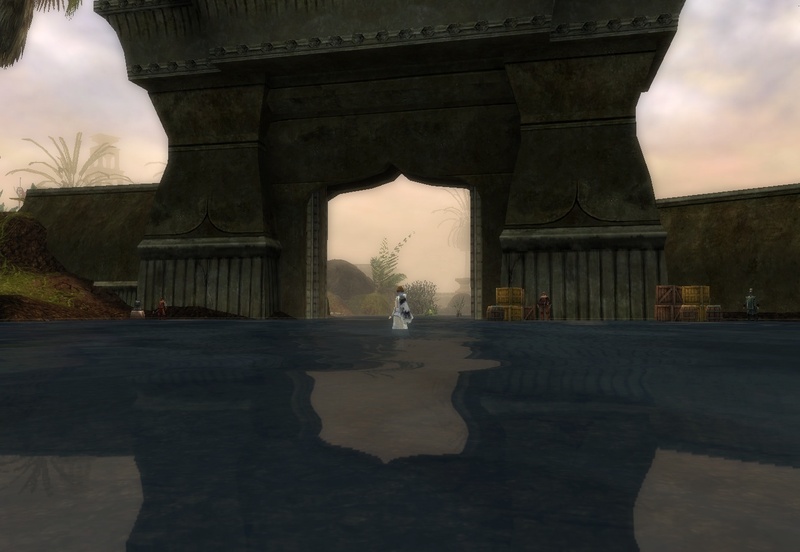 It is the home of the Luxons, whose entire watery realm was frozen into solid jade when the Jade Wind swept across the region.” (http://wiki.guildwars.com/wiki/The_Jade_Sea). What could be better? My desktop, a Dell Dimension 8400 is 4 years old, but I just got the hard drive replaced, and it was still under warranty! It runs fine, though I’ll be putting more memory in it – 1GB is not enough nowadays. I want to get a new desktop, but I think I’ll wait until Windows 7 is out. I do like my new screen setup. Last Thanksgiving I participated in the “Black Friday” shopping experience. I showed up at Fry’s Electronics at 4:50 AM, the Friday after Thankgiving (US Holiday in November) to get my 21.6 inch wide screen monitor, for cheap. Combined with my 17 inch monitor, I finally have enough screen real estate so that playing games and doing work is a pleasant experience. Guild Wars Prophesies, pre searing. My elementalist is battling two Blood Bandit Sworns, female bandits who roam the pre-searing world of Ascalon. These are vicious fighters, and they attack on site! 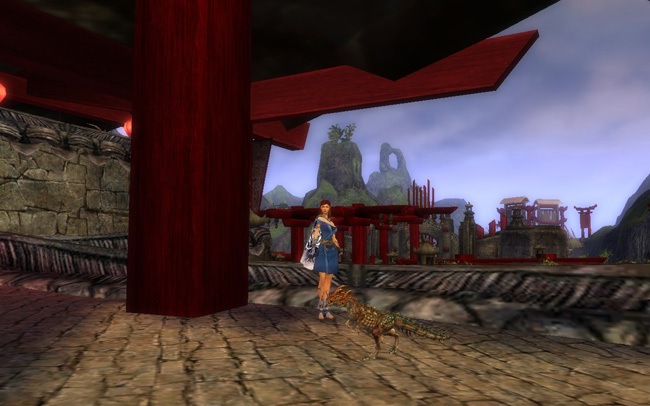 You can view yourself closer in Guild Wars, but sometimes I like to pan all the way out to get a more panoramic view of my avatar in the world. Guild Wars Prophesies, post searing. I’ve pushed the in-game view far away from my avator to get this view. My elementalist (on the right) is on a quest in the area west of Ascalon City. I’m with a henchman, a computer generated character who is a member of my party. She’s good at healing, but not much of a talker. I’ve played Myst Online (Uru), an online multiplayer game, for forever, in game years. I was in the 2003 beta. I’ve played Uru through three multiplayer phases, and its solo player phase. I’ve been a forum moderator on two official forums. I’ve became friends with someone who worked for the publisher. I’ve corresponded with people on the developer side. I have a history. I know Uru. I’ve been a part of something. I’ll play online multiplayer Uru again, when it comes back. Sometimes I don’t even know if I like Uru anymore, but I can’t stay away. I’ll play Uru, but it won’t be an “exclusive” deal – another MMO calls. I’ve been playing Guild Wars for two months. I’ve never played an online RPG (MMO role playing game) – so I’m new, and I’m slow. Many people play Guild Wars – though estimates vary since there are no subscription fees. Over 5 million units were sold, but there are no good figures on how many are playing. It’s got experts, forums with many members, and people who have been playing since 2005. Some of the players must have played in the Guild Wars beta, so they’ve been around even longer. It’s interesting, going from one game where you have a history, to one where you have no history. I love Guild Wars, and I’m playing Guild Wars for the right reason, because I love it. Guild Wars is beautiful – a big world with a story and a lot to do. It’s an online, multiplayer game, but you can play this multiplayer game by yourself, with others, or you can head up a small group of AI (artificial intelligence) characters, when you are on a quest. What’s even better is that I, a new slow player who doesn’t play much – I’m in a guild! Here’s the story. You online players have heard this story before, but it’s new to me! In Guild Wars, a guild is a group of people who make up a social network (reference http://en.wikipedia.org/wiki/Guild_Wars#Guilds). Many MMORPGs have guilds; Uru has something equivalent, called a neighborhood. In Guild wars, guild members get a special “channel” in game, where you can talk to your guild mates, via text chat. The guild can purchase a guild hall, where you can hang out with members of your guild. The Guild Hall is a private area open only to guild members and guests. There are other goodies in the hall, but you get the general idea. “Hall” is something of misnomer, if you count the surrounding lands that make up your Guild hall. Our hall is beautiful. Our guild is great. Some of us play a lot, some of us play a little, and there is no pressure on how and when we play. As far as I can tell, my guild operates on the principle that we all have busy lives, so we should play how and when it works for us. Not all guilds in all games are like that. We are also in an alliance with other guilds, many of whom are former or current Uru players. Our alliance has a shared chat channel (talk via text), and we can visit the guild halls of the guilds in our alliance. We can also participate in alliance battles, but I don’t know how that works. I’m a PvE (player versus environment) sort of player. I engage in battle with opponents in my world (such as monsters), but I don’t fight other players. And how did I get to be a member of my guild and my alliance – through Myst Online Uru. Uru players started playing other online games, both before and after Uru’s cancellation. I was recruited by an Uru player (thanks C!) who noticed I was online in another game called “There”. She visited me in There, We started talking, and then C. saw my post in an Uru forum which said that I was playing Guild Wars. C recruited me to her guild. Aside from being a really nice person – she’s got a genuine talent for low key but effective PR! Long time online players may think “what’s the big deal”, but Uru attracted players who had never played an online game. Before Uru, many of us thought we could never play online multiplayer games. After Uru, many of us thought that we could only play Uru. Then it happened – people recruited their online Uru friends and acquaintances to other games, and their friends brought in other friends, and our game world expanded. I would have played Guild Wars without being magically asked to be in a guild, but it makes it extra wonderful to be in a Guild. I didn’t have to look for a guild. Thanks to C., I was invited to join a guild. So – this moving on thing is weird. I’m playing Guild Wars for the right reasons, because I love it. I’ve got no history in Guild Wars, unlike Uru. I’ll never be a legacy person, or an expert. But, oddly enough, I have connections – a community of Uru players who went to Guild Wars, and I can be a member of their group. I’m still playing by myself, but I also have a small group (a guild), and a big group (an alliance). I like it.